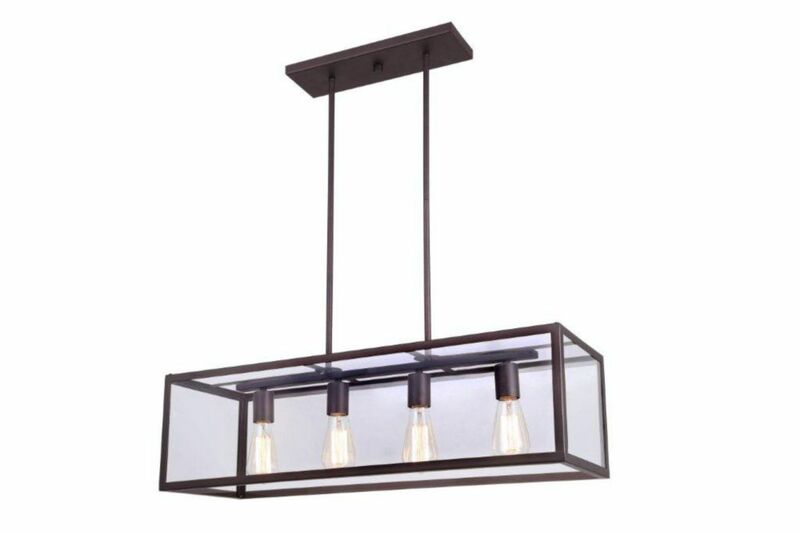 The RAE chandelier features an oil rubbed bronze finish with glass panels. The retro bulbs add exceptional appeal to this rather simple chandelier. This will make a great conversation piece for you and your guests. The Verona Collection from Globe Electric brings a cozy-chic element to any space. The beautiful dark bronze finish is complemented by antique brass accents to create a sophisticated old world feel. Reminiscent of the city it is named from, the Verona 4-Light Chandelier is simple in design but full of wonder. The beveled dark bronze frame and clear glass shades showcase the bulb of your choice and create a classy rustic design. Globe Electric's Vintage Edison Candelabra Light Bulb is recommended to complete the look but you can choose one of our many vintage Edison designer candelabra base bulbs to create a light that is truly your own. Includes all mounting hardware for quick and easy installation and requires four E12/candelabra base 60-watt bulbs (sold separately). RAE 4 Light Clear Glass ORB Chandelier in Oil-Rubbed Bronze The RAE chandelier features an oil rubbed bronze finish with glass panels. The retro bulbs add exceptional appeal to this rather simple chandelier. This will make a great conversation piece for you and your guests. RAE 4 Light Clear Glass ORB Chandelier in Oil-Rubbed Bronze is rated 5.0 out of 5 by 3. Rated 5 out of 5 by Mrs E from Beautiful dining room piece Easy to assemble and a great farmhouse looking statement price. Rated 5 out of 5 by Melissa from Love this fixture over my dining room table! The fixture was easy to install, and is very open concept. It offers a lot of light, and is super bright. I bought the short antique looking bulbs in the clear colour, and found they look great. I put a dimmer on the switch, so I have the option of the light not being so bright! Rated 5 out of 5 by VHHS from Perfectly suited for our dining room table Perfectly suited for hanging over our rectangular farmhouse table. The suggested antique filament bulbs are expensive but they totally compliment the fixture. We find a dimmer switch beneficial and allows us to create different moods. Hello, I would recommend you to try them out to see if it works for you as some people need bright white lighting in their dining room while others can do with more mood lighting. These bulbs are designed to give more of a warm glow effect, thanks! Can this be installed without the glass inserts? What are the dimensions of this product (RAE 4 Clear Glass ORB Chandelier) and can the height from the ceiling be adjusted. Hello, it is 30&quot;W x 15.5 - 57.5&quot;H, it is adjustable by down rods 6 x 12&quot; and 4 x 6&quot; included, thanks! Hello, this is certified for indoor use only, thanks! what is the dimensions of the cover plate? Hello, it is 14&quot; x 4.25&quot;, thanks! In specifications it states light is &quot;chain&quot; hung. Doesn't appear so in store. Is it chain hung? Looking for a slopped ceiling compatible light. Hello, it is hung with down rods and it is not compatible with sloped ceilings, thanks! Can you use LED lightbulbs in it and is it dimmable? Hello, yes you can use LED bulbs and it is dimmable, thanks! Hello, yes you can use LED bulbs with this fixture, thanks!